1. Colourful placemats. Set several different colors of construction paper (red, green, yellow, orange, purple, and white) on a table. Provide grocery store flyers and encourage children to cut out various food items and associate them to the paper of the corresponding color. For example, if they cut out strawberries, they should set them on the red paper whereas if they cut out broccoli, they should set it on the green paper and so on. Once all the pieces of construction paper are covered with food items, have children glue them in place. Laminate each placemat so you can easily wipe away any spills. 2. A full house. Collect several big-box store flyers. On a large piece of construction paper, draw a simple house outline. Divide this outline to create several rooms (a kitchen, a dining room, and a living room on the first floor and bedrooms, a bathroom, and a game room on the second floor. 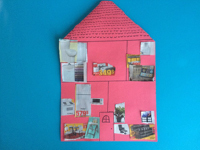 Identify each room with help from the children in your group. Once this is done, invite children to cut different items that can be found in a home (a bed, an oven, a toilet, etc.) out of the store flyers you have on hand. Help them associate each item to the correct room. If you wish, you can set your house on the floor once they are done. Children will enjoy playing in the different rooms with figurines and inventing scenarios. 3. Inexpensive figurines. You will need big-box store flyers that contain pictures of popular toys. Encourage children to look through the flyers to find pictures of their favorite characters (Dora, Bob the builder, Olaf, etc.). Help them cut them out and glue them on heavy cardboard, leaving a few centimetres at the bottom of each piece of cardboard. 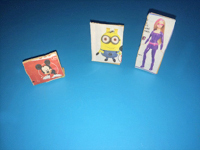 Fold these sections under each character to create upright figurines. Let children play with their inexpensive figurines as they wish. 4. Letter exploration. With the children in your group, cut several letters out of flyers. If you wish, you can have fun sorting the letters by placing, for example, all the "A's" in one envelope or container, all the "B's" in another envelope or container, and so on. When you are ready, select the letters needed to write each child's name and help them glue them on a colourful piece of paper in the correct order. Leave the letters in your writing area. 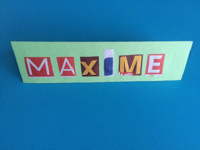 Older children will like to use word flashcards as models to write different words. Younger children will enjoy using them for alphabet-themed collages. Another great idea is to encourage children to arrange the letters in alphabetical order. 5. Tools in my toolbox. Collect several different hardware and big-box store flyers. Invite children to cut out several different tools. Cut a toolbox shape out of red construction paper for each child. 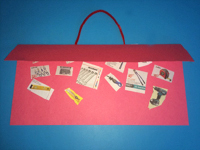 They will enjoy gluing the tools they find inside their paper toolbox. This activity can be adapted to create a unique Father's Day card or to decorate your construction area. 6. Paper bouquet. Draw a vase on a large piece of cardboard. Provide several grocery and big-box store flyers and ask children to cut out any flowers they can find. Let them glue the flowers above your vase to create a magnificent bouquet. This activity can easily be adapted to create individual Mother's Day cards or to decorate your daycare for spring. 7. Treasure hunt. Prepare a list of items children will have to search for in store flyers. For example, you can ask children to search for a toy that rolls. Once a child has found this item, ask your group to search for a bottle of shampoo. Other items that should be easy to find are a red clothing item, crayons, juice, shoes, a lamp, etc. This activity is great for developing children's vocabulary. Furthermore, it will help children practice paying attention to instructions. 8. Paper wardrobe. With your group, cut several different clothing items out of big-box store flyers. Glue the sweaters, dresses, pants, skirts, coats, etc. on heavy cardboard and laminate them. 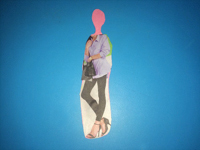 Cut simple silhouettes out of colourful construction paper and invite children to use the clothing items they like most to dress up these simple paper dolls. They will enjoy making new wardrobe selections over and over again. 9. Look and see labels. Invite the children in your group to help you use flyers to organize your toy chests, shelves, and bins as well as your arts & crafts material. For example, they can cut out pictures of toy cars and glue them on the bin that contains this type of toy, find a picture of crayons for your crayon box, etc. Having children participate in this task will help them understand where everything goes. 10. Illustrated menu. Cut food items that you serve regularly out of grocery store flyers. Use them to create a chart that can be used to share your daily menu with your group and parents. Laminate the food items and glue a piece of magnetic tape behind each one. Hang a cookie sheet on a wall in your kitchen area or near your daycare entrance. If, for example, you are planning on serving apples as a morning snack, chicken, potatoes, and peas for lunch, yogurt for dessert, and muffins as an afternoon snack, simply stick these items on the cookie sheet. You may choose to divide your cookie sheet into three sections: one for the morning snack, one for lunch, and one for the afternoon snack. Children can help you identify and display the correct food items each day. This will give them the opportunity to practice recognizing and naming different foods.